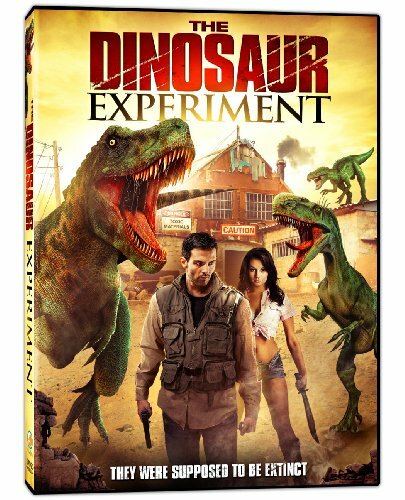 The Dinosaur Experiment , coming to VOD (April 1) and DVD (May 6), from Uncork'd Entertainment. A quaint, little town in Texas, Fossil Ridge, is 100 miles from anywhere - Home to one gas station, which doubles as a diner, and not much else. But the sleepy community is abruptly turned upside down when it's discovered that a local cattle ranch is actually a breeding ground for ferocious velociraptors blood-thirsty dinosaurs long-thought extinct. When the vicious beasts escape, the terrified townspeople must fight to survive the deadly, prehistoric killers hunting them down as prey. Starring Lorenzo Lamas (USA's Renegade, CBS' The Bold and the Beautiful), Donny Boaz (The Con-Test, Killer School Girls From Outer Space, The Great Debaters), Declan Joyce (Now Here, Six, Scorched), Lexy Hulme (Lord of Tears) and Jana Mashonee. The Dinosaur Experiment is presented in widescreen with an aspect ratio of 16 x 9 and 5.1 Dolby Digital Surround Sound.